This articles draws a parallel between several stages of AAP’s evolution and some companies. Each of the 6 perceived stages of AAP’s existence till now are compared to a company. Like Infosys, the anti-corruption movement started with a bunch of people motivated by one single person. While Murthy held the fort for Infosys, Anna was the focal point of the movement. In both the cases, founders invested themselves personally and reaped rich dividends later: Financial returns in case of Infosys and Publicity & Public image for co-founders of the movement. Both faced a financial crisis in the beginning but scripted a turnaround soon after that. While IPO breathed a fresh lease of life into Infosys, donations from public supported Kejriwal & Co. Above all, both have a striking similarity – with their roots in the Indian middle class. Infosys stands as testimony of their dreams and the anti-corruption movement is a reflection of their frustration with the establishment. If “the social network” movie were to be believed, the philosophy behind building a site like facebook was conceived by Tyler Winklevoss which was called HarvardConnection. Mark Zuckerberg was a part Tyler’s group before he himself started facebook. In case of AAP too, it was Kejriwal who broke away with Team Anna to form his own political outfit. Like the allegations on Zuckerberg that he used Tyler’s money for his own experiments, Anna demanded the Kejriwal should come clean on issues of IAC’s (Indians Against Corruption) money being channelled to AAP. While the founders wanted to test the idea of creating a social network within a community (Harvard University), AAP’s initial focus remained Delhi and surrounding regions. Typically, an RGV’s movie is embroiled in a controversy before the actual movie release. As we know, the secret intention is to gain some mileage in the media that contributes to film’s publicity. And this happens with no cost incurred to RGV. Arvind Kejriwal has exactly done the same: With a series of continuous exposes on heavyweights, Kejriwal has become media’s darling. He has cleverly exploited media houses’ hunger for sensational news to stay on top of news charts. Then end customers on the other hand are fed-up with the existing options. While the audience wanted some deviation from the typical Bollywood formula, voters are fed up of existing political parties and are yearning for a new option. This in turn fuels the need for news channels to go behind the topics that fuel their TRPs: win-win for both. When it started, Whatsapp’s sole intention was to provide a messaging platform for mobile users which is free of ads and other glittery features. It mostly relied on word of mouth publicity with no efforts towards marketing. Their goal remained simple: To have as many users as possible on the platform without any correlation to revenues or profits. AAP’s evolution has exactly the same characteristics. Their single point agenda was a corruption free government with an end to VIP culture. They have gone door to door in every corner of Delhi to garner support. Even while being a third party app, whatsapp provided a radical alternative to SMS that has been there for few decades. Similarly, Kejriwal has gone head-on with Shiela Dixit who has become the face of congress in delhi over the period of time. Both Nokia and AAP are leaders in their segment who crashed owing to inept handling of their position. At the time when the apps were influencing purchase decisions, Nokia was struck with its old strength of higher battery life and a simple UI. After the elections, while people wanted a stable and working government, AAP persisted with its old activist philosophy. 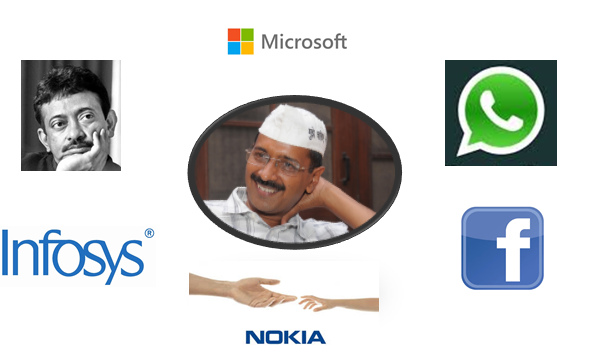 As a result, Nokia lost its market leader position and AAP lost its credibility as an alternative to Congress and BJP. As the events turned out, the activist investors troubled the financially struggling Nokia to return the cash while AAP’s donations witnessed a sharp fall after Somnath Bharti’s theatrics at Khirki and Kejriwal’s dharna. In the context of mobile/tablet market, Microsoft owns a meagre share. But with the user base of its products being huge, competitors can never take the company easy. This has a significant resemblance with AAP’s role in the election. The 2-3% vote share that AAP has might not win them a good number of seats but the public belief in a clean government that they promise has certainly sent jitters among the biggies in fray. Recently, Microsoft has released MS Office for the devices running its rival’s OS (Office for iPad) to expand user base for its products. Similarly, AAP has put up Kejriwal against Modi not with an intention of winning Varanasi but as a strategic move to remain in media limelight. While Microsoft’s future depends on how well it can swim the trouble waters of Mobile revolution, AAP’s future has a big bearing on its performance in the general elections. With a likely lacklustre performance in May 2014 on cards, AAP can be likened to Yahoo which faces prospects of extinction and eagerly awaiting another chance of revival while simultaneously expanding into unexplored geographies. His recent article on Why MBA?.